We have developed a PC software package called DAQLOGGER for the μ R, VR and DX series. This software allows real-time data acquisition, for data viewing and hardware configuration. As the process of acquiring data from hardware has priority over other DAQLOGGER processes, we separated the process from the user interface. One thread is assigned to each communication port connected to recorders. This allows for data acquisition from multiple recorders, through a maximum of 384 channels at intervals as short as one second. A maximum of 32 recorders (μR, VR and DX series combined) can be connected through an Ethernet, RS-232 and/or RS-422A/485 network. PC software as the front end of a recorder has become more and more important recently in the industrial measurement field as the personal computer becomes increasingly popular. In the past, we were making efforts to develop PC software for acquiring, viewing and setting data for a single recorder only. In recent years, there has been a growing demand for software serving the same purpose for multiple recorders. Yokogawa therefore has been providing PC software packages that allow for connecting up to 16 units of the μ R1000, μ R1800, VR100 and VR200 industrial recorders combined through a RS-422-A communication network, as well as acquiring, viewing and resetting data in real time. Recently, we have developed a PC software package called DAQLOGGER, in sync with the release of the DAQSTATION data acquisition station (hereafter referred to as the DX series), in order to support DX series recorders in addition to the recorders mentioned above. The DX series features state-of-the-art networking functions and advanced information handling ability. To support the DX series, we added Ethernet and RS-232 to our line of supported communication standards, which permits the connection of up to 32 recorders. We also incorporated additional functions, such as the report function that outputs hourly, daily and monthly reports, DDE2 server function that exchanges data with other programs, project function that allows for switching between two or more different operating environments, and password protection function that protects users' data acquisition work against inadvertent system operation. Figure 1 shows an example of a window displayed by the monitor software of the DAQLOGGER software package. As this window shows, the software package supports a variety of display formats. The area A is a window for waveforms, area B is a window for bar graphs and graphical representations of electric meters and thermometers, area C is a window for color graphs, area D is a window for alarm overviews, and area E is a window for digital readings. As a separate process (unit in which scheduling is carried out or such resources as memory are allocated when Windows executes a program), the data acquisition block for acquiring and filing data has been segregated from the user interface that undertakes user operation. This strategy has made the data acquisition block extremely immune to the effects of accidental failures, such as a hang-up of interface resulting from user operation. The μ R and VR series only support the communication standard, RS-422-A. The DX series, on the other hand, has optional support for the communication standards RS-232 and RS-422-A, in addition to its standard communication means, Ethernet. The DAQLOGGER not only supports all these three standards but also permits mixed use of them. This means it is possible to build a system using a combination of different communication methods. The new software package allows for the connection of up to 32 units of the μ R, VR and DX series recorders combined. In addition, we have increased the priority level of the process of the data acquisition block. By assigning a thread (unit in which Windows executes a program) to each communication port for communication with each recorder, we have made it possible to acquire data through a maximum of 384 channels at the shortest interval of one second. The DAQLOGGER is packed with multiple software components, including the monitor software that shows data being acquired and viewer software that redisplays a file of data. 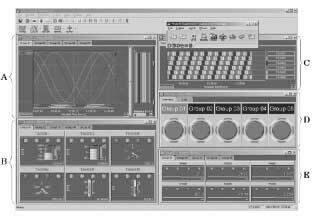 By combining the Yokogawa-original graphic class library with MFC (Microsoft Foundation Class Library, the C++ library for developing Microsoft Windows applications), a variety of our unique components are allowed to run on Windows. In addition, each software component shares the uniform formats of window views with other software components. Although the DAQLOGGER consists of more than one software component, as explained above, they work in conjunction with one another. 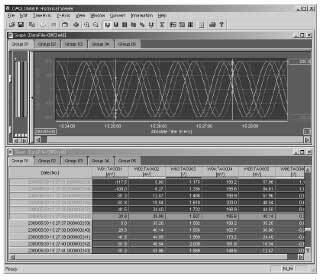 For example, the logger software collects data from recorders, and at the same time, the monitor software displays waveforms and the report software performs statistical computation. Furthermore, the DDE server software updates the data. Data-sharing memory and message communication realize this cooperative operation. The DAQLOGGER consists of the software components listed below. 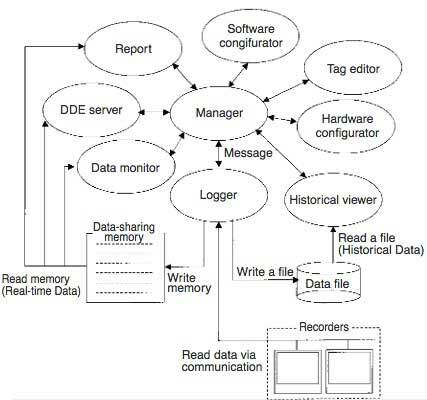 Figure 2 illustrates how the DAQLOGGER is configured with these components. The manager software comprises multiple command buttons, starts up other software components, and serves as a user interface for the logger and report software. In addition, it governs the way each component work with others. The logger software acquires data and saves it as a file. It writes the data to a file and saves the data in data-sharing memory for use by the monitor software, report software, DDE server software and other software. The logger software has no user interface to prevent user operation from affecting data acquisition. The software runs without displaying any window views. The priority level of the logger software's process is set higher than that of any other software's process. Consequently, other running software components do not affect the performance of data acquisition. For smoother data acquisition, one thread is assigned to each communication port for communication with connected recorders. This strategy protects the rest of the recorders from losing any bit of data even if communication with a particular recorder is disabled due to a certain failure. The monitor software retrieves data, which was acquired by the logger software, from the data-sharing memory to show it on the display. It presents window views in a variety of formats, including waveforms, digital readings, bar graphs, graphical representations of electric meters and thermometers, color graphs, alarm overviews, and alarm logs. The DDE server software retrieves data, which was acquired by the logger software, from the data-sharing memory to provide DDE services. With these services, users can freely use the data together with such spreadsheet software as Microsoft Excel or simple programming languages such as Visual Basic. The report software retrieves data, which was acquired by the logger software, from the data-sharing memory to create hourly, daily and monthly reports. Each report can be output in its unique binary format using the historical viewer software, or in a tab-separated text format, or by direct output through a printer. The viewer software shows data, saved as a file by the logger software, in trend graphs and numerical value tables. It can also show a file data of being acquired by the logger software. With this software, it is also possible to view binary data, which is output by the report software, in a spreadsheet format. Other functions include such data processing functions as conversion of data to an Excel or ASCII file, point-to-point computation, and printing. The hardware configurator software reads the hardware setting values of μ R1000/1800, VR100/200 and DX100/200 recorders via communication or such a medium as a floppy disk. Then, users can view and edit the setting values in a spreadsheet format. The settings thus edited can be fed back to the hardware also via communication or such a medium as a floppy disk. The software configurator software setting software defines communication settings such as the port addresses and baud rates of recorders to be connected, as well as the model number, number of channels, and options of each recorder. In addition, the software can automatically identify a model connected to an already configured communication port. 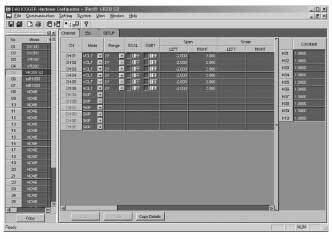 The tag editor software can define any name (tag name) for each channel of a recorder configured using the software configurator software. The tag name is used for data acquisition and data viewing. It is also possible to receive and read tag names, which have been preset in a recorder, via communication. The primary purpose of the DAQLOGGER software package is to acquire data at fixed intervals. Data acquisition is the function whose performance is considered most important. To improve the performance, we have designed the logger software so that it has the functions listed below (see Figure 5 for the configuration of the logger software). As discussed above, it is essential to minimize the possibility for the processes of other functions to affect the performance of item 1 "reading measurement data at fixed intervals." We have therefore separated the content of the logger software into four threads. The following lists the four threads, along with their roles. Main thread: Controls other threads. Can thread: Reads measurement data at fixed intervals. Also writes the read data to local memory. Copy thread: Copies measurement data from local memory to data-sharing memory. File thread: Converts the content of data-sharing memory to a file according to data acquisition settings. By allocating threads in this manner, we set the priority level of the thread responsible for "reading measurement data at fixed intervals" higher than those of the other threads. This ensures that the scan thread runs prior to any other thread and, therefore, is hardly susceptible to a delay that may occur in other threads. Another functional issue is that the logger software performs data acquisition from more than one recorder. This means the software must communicate with multiple recorders at the same time. Now it should be noted that performance is inefficient when any one scan thread successively runs communication processes for all recorders. Improvements in performance can be expected by assigning each process of communication with one recorder to just one scan thread, and then letting each scan thread run its process asynchronously. For this reason we assigned one scan thread each to recorders with which the logger software communicates. Thus the logger software has multiple scan threads. Writing measurement data to the data-sharing memory is another function of the logger software. All scan threads do not perform this function directly. Each scan thread has its own local memory unit into which it writes the measurement data it reads. 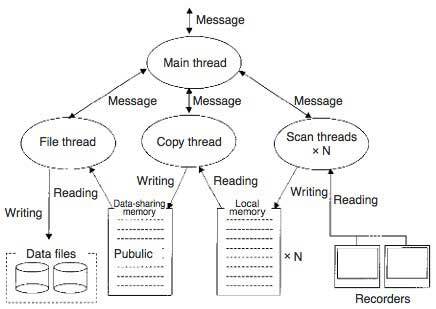 The work of writing data from multiple local memory units owned by multiple scan threads to the data-sharing memory is done by the copy thread. This is how the frequency of access to the data-sharing memory is reduced. The reason for reducing the frequency of access is that read access by multiple processes to the data-sharing memory results in a significant overhead increase in the exclusive process that controls reading and writing. We connected in-plant recorders to a communication network via the DAQLOGGER, acquired data, applied a statistical process to the data at the end of the month using the report software, and sent the resulting data to the headquarters. This procedure replaced the conventional work process of reading data from paper-based records and eliminated related human labor, leading to improvements in work efficiency. We monitored multiple in-plant recorders in another building through the DAQLOGGER in real-time. This application enabled us to readily recognize such events as the occurrence of alarms and eliminated the need for making periodic inspection rounds, saving human labor. In this report, we have discussed the features and software configuration of the DAQLOGGER, along with the structure of the logger software and application examples. With the DAQLOGGER, it is possible to easily integrate multiple recorders as if they were a single system and meet users' needs with its wide choice of functions. The DAQLOGGER is a PC-based software package that offers both safe operation and an excellent user interface. With the package, we are ready to provide up-to-date solutions to not only the users of the DAQSTATION, the next-generation data acquisition station, but also to the users of existing μ R1000/1800 and VR100/200 industrial recorders. We are confident that there are many potential users who will recognize the excellence of the package once they use it. Obuchi K, Nagumo Y, Tanizumi Y, Murata H, "DAQ32 Plus PC-based Software for DARWIN Series", Yokogawa Technical Report, Vol. 43, No. 2, pp. 63-66 (1999) in Japanese. Dynamic Data Exchange is a function designed to perform data exchange between Windows applications. Windows, Windows NT, Excel, Visual C++ and Visual Basic are either trademarks or registered trademarks of Microsoft Corporation. DAQLOGGER is a trademark of Yokogawa Electric Corporation.